Every summer, volunteers get their hands dirty by pulling weeds in the Castle region. Castle-Crown Wilderness Coalition organizes weed pulls throughout the spring and summer where volunteers and guides search for and remove invasive plants by hand. These small actions have big impacts to the ecological health of the region. 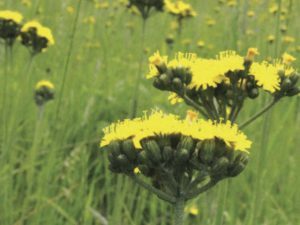 “Invasive species are the second biggest threat to biodiversity after habitat loss,” said Megan Evans, an ecologist with Alberta Parks. The consequences of invasive species go beyond ecology. Weeding is one approach to manage invasive species, and it has resulted in noteworthy successes in the Castle. Plants and animals can be introduced into a region where they have not been before. This can be done naturally as organisms extend their habitat range. But the most common route is from humans. To the detriment of native species, introduced species have the potential to thrive in their new habitats. A special niche or the lack of natural competitors or predators means the introduced species can flourish. These are invasive species. And the impacts are extensive. “Invasive plants can displace native species, reduce forage and habitat for wildlife, increase topsoil erosion and increase sedimentation into waterbodies,” said Evans. Oxeye daisy is an invasive species that has become a particular concern in the Castle region. It is a white ornamental flower that can be found in some ‘wildflower’ seed mixes. Although considered a pretty flower, one oxeye daisy plant can produce over 500 seeds that remain viable in soil for up to three years. 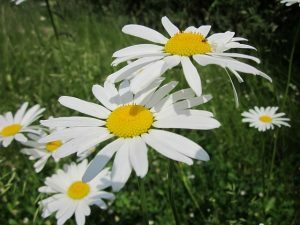 Oxeye daisies can overrun native plants and take multiple seasons to remove from a region. In addition to the oxeye daisy, Evans said invasive plants with “sizable infestations” in the Castle include yellowdevil hawkweed and tall buttercup. There is no one-solution-fits-all to control invasive species. In fact, Evans’ career is focused on researching and implementing the best strategies to manage invasive species in Alberta. “We take an integrated approach to invasive species management and we use as many different tools and control methods as possible,” she said. And these methods are vast: herbicide application, hand pulling, digging, mowing and biological control. Alberta Parks monitors invasive species to ensure the methods are appropriate for the species and regions, and to make sure they are as effective as possible. Evans and her team of professionals continuously seek the best options for infestations. For non-professionals, manual weed pulling is a safe method that ensures only the invasive species are removed. However, weed pulling is most effective when there are more hands. 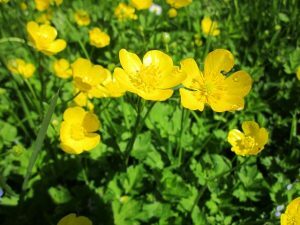 The CCWC organizes weed pulls through the summer to assist Alberta Parks in the control and care of sensitive regions and notable infestations. Not only are the weed pulls invaluable to the health of the Castle, but they also can be rewarding for the volunteers. Along with Alberta Parks staff, the CCWC helps organize the West Castle Ecological Reserve Weed Community Weed Pull. This event has been running annually for a decade and it has seen a large success in the reduction of invasive species and increase in community awareness on the issue. And the impacts are noticeable. Last year alone, volunteers picked invasive species and garbage from the side of 100 km of roadways in the Castle region. Ryan invites everyone to give an extra pair of hands to weed pulls this summer. Weed pulls are scheduled throughout the summer and are an opportunity to care for the Castle. Download the 2017 hike and weed pull schedule for more information.